inside the box: December 2017 — myblackbox co.
Welp, the time has come to wrap up 2017 in many aspects, including our last blackbox of the year. Since shipping our first box in March, we have learned a lot, made quite a few changes and are certainly excited for what's to come in 2018. To close out the year, we are bringing your another four great Black-owned products from the following categories: bath & body, fashion accessories and two items from home & office. Inside the Box is your look at our curated collection for the month. You'll get to learn a little more about our thoughts, selection process, and featured businesses. As always, make sure to share your unboxing photos and videos by tagging #myDECEMBERblackbox. We love sharing what you've discovered. Bask & Bloom - Balancing Toner: With the cold winter months in the midst, a healthy regimen for keeping skin fresh, clean and moisturized is in order. The Balancing Toner from Bask & Bloom is great to use after a face cleaning to get rid of excess dirt. Owner Candera loves natural remedies using herbs and created Bask & Bloom out of her love for conscious beauty products. The collection includes hair masques, shampoo, conditioner, soap, facial cleansers, body butter, and more! Love Carter Designs - Follow Your Heart Necklace: This simple, yet stylish statement necklace by Lover Carter Designs is a nice reminder to follow your heart in all you do. We wanted to include an encouraging jewelry piece this month as we head into the new year. Love Carter Designs is an inspirational jewelry collection which has bracelets, necklaces, phone cases and personalized jewelry as well co-owned by Alecia. LooHoo - PeaceFelt Collection: The PeaceFelt Collection by LooHoo, owned by Cyndi, was a unique find. These wool stones can be used to freshen up a room, your car or even a clothing drawer by adding a few drops of your favorite essential oil. They are also great for relieving stress by lightly rubbing the stones. LooHoo also makes natural wool dryer balls that are environmentally-friendly, reusable and cost effective. Page Eleven Paper Goods - Travel Journal: We were happy to find the beautiful Travel Journal created by Elisha of Page Eleven Paper Goods. This journal will be particularly handy for all those looking to fill their passport books in 2018 or traveling domestically. Page Eleven Paper Goods offers a collection of planners and journals to help guide you to the next level by keeping you focused and organized. 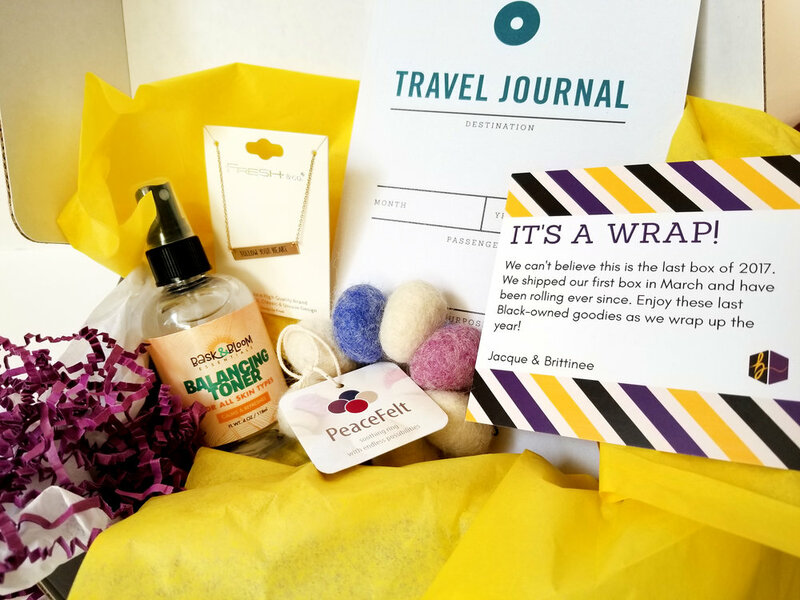 As our last box of 2017, we were happy to wrap it up with a great collection of products to fuel you into the new year on a mission of freshness, drive, peace and eagerness to travel uncharted territory. As we flow into 2018, continue this journey of discovery with us by subscribing to your monthly blackbox here. your box full of hue.